Where Does the Formula for a Term in an Arithmetic Sequence Come From? Trying to find the value of a certain term in an arithmetic sequence? Don't want to go through the terms one-by-one to find the one you want? 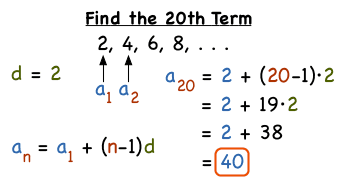 Use the formula to find the nth term in an arithmetic sequence! This tutorial shows you how find that formula!